The objective of this study was to evaluate the antifungal activity of nanoemulsions encapsulating essential oil of oregano (Origanum vulgare), both in vitro and after application on Minas Padrão cheese. Nanodispersions were obtained by the phase inversion temperature method. Cladosporium sp., Fusarium sp., and Penicillium sp. genera were isolated from cheese samples and used to evaluate antifungal activity. Minimal inhibitory concentrations of non-encapsulated and encapsulated oregano essential oil were determined, and they were influenced by the encapsulation of the essential oil depending on the type of fungus. The antifungal activity of the nanoencapsulated oregano essential oil in cheese slices showed no evidence of an effect of the MICs, when applied in the matrix. On the other hand, an influence of contact time of the nanoemulsion with the cheese was observed, due to the increase in water activity. It was concluded that nanoencapsulated oregano essential oil presented an inhibitory effect against the three genera of fungi evaluated. If environmental parameters, such as storage temperature and water activity, were controlled, the inhibitory effect of nanoemulsions of oregano oil could possibly be greatly improved, and they could be presented as a potential alternative for the preservation of Minas Padrão cheese against fungal contamination. Among the nanostructures which can be produced, there are the nanoemulsions, which are emulsions with mean droplet size of 20–200nm. Nanoemulsions exhibit high kinetic stability and are therefore stable for a long period of storage.21 Among the production methods used to obtain nanoemulsions with average droplet sizes smaller than 50nm, there are low-energy methods, such as the phase inversion temperature (PIT) method. Such methods are based on the change in solubility of non-ionic polyethoxylated surfactants with temperature.22,23. Minas Padrão is a pressed, semi-hard cured cheese consumed extensively in Brazil.24 It is produced with pasteurized milk and has characteristic color, odor, and flavor.25,26 It is a product that requires refrigeration during storage and commercialization, as higher temperatures can decrease its quality.27 As it is a ripened product, it is susceptible to contamination by pathogenic bacteria and fungi during the maturation process. This may be a cause for serious concern, as the current Brazilian legislation does not establish limits for contamination by fungi. Therefore, considering the increasing consumer demand for natural ingredients and the possibility of using essential oils in food preservation, the objective of this study was to evaluate the antifungal action of the oregano essential oil encapsulated in nanoemulsions, both in vitro and in Minas Padrão cheese. Nanoemulsions were produced using essential oil of Origanum vulgare (Ferquima, Cotia, SP, Brazil) and sunflower oil (Cargill, Mairinque, SP, Brazil). The surfactants used were PEG-40 hydroxylated castor oil (Ricinus communis) (Cremophor RH 40, BASF, Ludwigshafen, Germany), polyoxyethylene 4-lauryl ether (Brij 30, Sigma-Aldrich, St Louis, MO, EUA), and sorbitan monooleate (Span 80, Sigma-Aldrich, St. Louis, MO, USA). Ultrapure water (Direct Q3, Millipore, Billerica, MA, USA) was used throughout the study. For the isolation and identification of the fungi from the cheese samples, dichloran rose bengal agar chloramphenicol (DRBC) agar (Acumedia, Neogen, São Paulo, SP, Brazil), dextrose potato agar (DPA, Acumedia, Neogen, São Paulo, SP, Brazil), and chloramphenicol (Homeopatia Ouro Preto, Pirassununga, SP, Brazil) were used. Nanoemulsions were produced by the PIT method according to Moraes-Lovison et al.28. The components of the nanoemulsions (sunflower oil, surfactants, deionized water, and oregano essential oil) were mixed and magnetically stirred at 1350rpm, and this mixture was heated to 65°C. The two formulations of nanoemulsions produced are described in Table 1. Afterwards, this mixture was cooled rapidly by placing the dispersion in jacketed vessels cooled by water at 3°C, under magnetic stirring, until it reached room temperature (cooling rate: 10°C/min). The heating/cooling cycles were repeated twice. Formulation of nanoemulsions encapsulating oregano essential oil. To evaluate the in vitro inhibitory activity, non-encapsulated oregano essential oil and nanoemulsions of oregano essential oil were tested. The concentrations of oregano essential oil used are shown in Table 2. Concentrations of non-encapsulated and nanoemulsified oregano essential oil used in the in vitro assays. A volume of 0.1ml of spore suspension of each fungus (Cladosporium sp., Fusarium sp., or Penicillium sp. ), containing between 104 and 105 spores/ml in potato dextrose agar+chloramphenicol (PDA+C) containing each non-encapsulated essential oil or nanoemulsions was spread on Petri dishes. The inoculated dishes were incubated at 25°C for 7 days.30 Inhibitory activity was determined by the presence or absence of fungal growth. The minimum inhibitory concentration (MIC) was determined as the lowest concentration of non-encapsulated oil or nanoemulsion at which there was no fungal growth.30 All experiments were performed in duplicate. Slices of Minas Padrão cheese (2mm thick and 50mm in diameter, previously exposed to UV light for 60min) were immersed in the dispersions of nanoemulsions. The treatments used for immersion were: control, non-diluted nanoemulsion, MIC, nanoemulsion formulation A, and nanoemulsion formulation B. The treatments are described in Table 3. Treatments used in cheese slices. Emulsion concentration: μg oregano oil nanoemulsified/mL immersion liquid. The antifungal effect of nanoemulsified oregano essential oil was evaluated by measuring the contaminated area due to the fungal growth of each genus on the cheese slices. The contaminated area of the slices was determined using image processing software, whereby total (cheese slices) and contaminated areas were estimated automatically by pixel count, and the percentage of contamination was calculated by comparing the two areas. As expected, fungal growth occurred mainly on the surface of the cheese samples (56% of the contaminated samples), as Minas Padrão cheese is often exposed to the environment when it is submitted to the maturation process. The genera of fungi with the highest occurrence on the surface were Penicillium sp., followed by Cladosporium sp. and Scopulariopsis sp., with percentages of 67%, 18%, and 5% of total, respectively. However, in the interior of the cheeses Cladosporium sp. occurred at a higher percentage (33%) in terms of contaminated area, followed by Fusarium sp. and Scopulariopsis sp. (both with 14%), and finally by Penicillium sp. with 12%. The MIC of non-encapsulated oregano essential oil was determined for each fungus. For Fusarium sp. and Penicillium sp., the MIC values were 0.2μg/ml and 0.3μg/ml, respectively. In the case of Cladosporium sp., it was noticed that the fungus did not grow at all, even at the lowest concentration of oregano essential oil tested. Such a result may indicate that this genus of fungus was very susceptible to the inhibitory effect of oregano oil when compared with the inhibitory effect of oregano essential oil on Fusarium sp. and Penicillium sp. (Table 4). Minimum inhibitory concentration values for the fungi tested, for non-encapsulated oregano essential oil and nanoemulsions encapsulating essential oil. Regarding the antifungal activity of nanoemulsions, for formulation A the MICs obtained were 0.26μg/ml for Cladosporium sp., 0.113μg/ml for Fusarium sp., and 1.62μg/ml for Penicillium sp. As for formulation B, the values of MIC were 0.32μg/ml, 0.1μg/ml, and 0.8μg/ml for Cladosporium sp., Fusarium sp., and Penicillium sp., respectively. The MICs found for nanoemulsion A were thus higher than those for nanoemulsion B, for the three evaluated fungi. Such a result was probably due to the higher oil of oregano content in formulation B (5%) compared with formulation A (3.25%). Therefore, it was concluded from the MICs obtained that nanoemulsions encapsulating oregano essential oil, obtained by the PIT method, showed antifungal activity similar to that of oregano oil applied in its free form, justifying the continuation of research to verify the antifungal activity in Minas Padrão cheese. Three factors were considered in the evaluation of antifungal activity of nanoemulsions encapsulating oregano essential oil: the amount of oregano essential oil, the period of immersion of the cheese slices in the nanoemulsions, and the storage temperature. Regarding the influence of temperature on antifungal activity, fungal growth was not observed on cheese slices stored under refrigeration, neither for slices immediately removed nor for those immersed for 30min in the nanoemulsions. No fungal growth was detected after 30 days of storage on cheese slices immediately removed from the nanoemulsions containing oregano essential oil and maintained at 25°C. The only conditions under which the antifungal activity of nanoemulsions could be evaluated was storage of cheese slices at 25°C following 30min of immersion. When the general effects of both nanoemulsion formulations (A and B) on the growth of the three evaluated fungal genera were compared, the nanoemulsions presented significant growth inhibitory effects. Treatments A1 and B1 inhibited the growth of Cladosporium sp. and Fusarium sp. for 30 days during storage. Treatments A3, A4, B3, and B4 of nanoemulsified oregano oil delayed the onset of growth until the seventh day of storage for the same fungal genera. In the case of Penicillium sp., only the higher concentrations of nanoemulsion (treatments A1 and B1) inhibited its growth until the seventh day of storage, indicating that this fungus presented higher resistance to the antifungal effect of nanoemulsified oregano essential oil than fungi of the genera Cladosporium sp. and Fusarium sp. (Fig. 1). Fungal growth on Minas Padrão cheese slices immersed for 30min in nanoemulsions, stored at 25°C. Concentration means μg oregano essential oil/ml nanoemulsion. Regarding the antifungal activity of the two nanoemulsion formulations at the MIC, they did not demonstrate the expected effects (with respect to the in vitro assays) when applied on cheese slices, as fungal growth was higher than on the control slices. Such a result may be due to the high water activity, as slices were immersed for 30min in the nanoemulsions. Although the antifungal action of nanoemulsified oregano essential oil at different concentrations was verified, it was noted that higher concentrations of nanoemulsions (treatments A1 and B1) were required to significantly inhibit fungal growth on cheese slices. The present results agree with those of Kure and Skaal32 and Kure et al.33, who isolated 13 species of Penicillium, Alternaria, Aureobasidium, Cladosporium, Epicocum, Geotrichum, Mucor, Phoma, Trichoderma, and Ulocladium from semi-hard cheeses. In the same way, De Morais34 isolated the genera Penicillium, Aspergillus niger, Rhizopus, Aspergillus ochraceus, and Mucor from butter cheese. Therefore, considering the fungal genera found in the contaminated cheese samples, subsequent steps of the study were performed with Cladosporium sp., Fusarium sp., and Penicillium sp. In the case of Penicillium sp., the values of MIC were close to those reported by Stupar et al.35, who obtained MICs in the range of 0.2–1.0μg/ml for the same fungal genus. For Cladosporium sp., the obtained MICs were higher than those found by Zabka et al.36 for Cladosporium cladosporoides (0.028–0.066μg/ml). For Fusarium sp., Daferera et al.37 and Stević et al.38 found MICs of 150μg/ml and 70–1160μg/ml of oregano essential oil, respectively, values much higher than those presented in this study. Nanoencapsulation can lead to a positive or negative impact on the antimicrobial activity of essential oils relative to that of non-encapsulated essential oils.18,39,40 In this study, when the inhibitory effect of the non-encapsulated oregano essential oil was compared with those of the two nanoemulsion formulations (A and B), it was found that for Fusarium sp., the encapsulation of the essential oil improved its antifungal effect, whereas for Penicillium sp., the use of oregano essential oil encapsulation diminished its inhibitory effect against this genus. Considering the data obtained for fungal growth on the refrigerated slices, as the studied fungi can grow at very acid or very basic pH, at temperatures from 0°C to 37°C, and at high or low substrate moisture levels, the results indicate the nanoemulsions encapsulating oregano essential oil presented very good antifungal activity, especially under conditions of low temperature, due to which there was no growth during storage for any length of time. 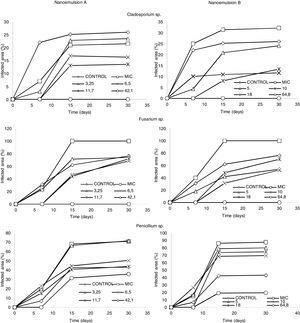 The data obtained in this study proved the in vitro antifungal activity of nanoemulsions encapsulating oregano essential oil, against the growth of Cladosporium sp., Fusarium sp., and Penicillium sp. The antifungal activity was verified on Minas Padrão cheese slices inoculated with the same fungal genera. In both types of assays (in vitro and cheese slices), Penicillium sp. presented higher resistance to the antifungal effect of oregano essential oil than Cladosporium sp. and Fusarium sp. The antifungal effectiveness of the essential oil of nanoemulsified oregano in Minas Padrão cheese was highly dependent on the amount of nanoemulsion, immersion time of slices, and storage temperature. These results can help to establish optimized conditions for the continuation of studies of antifungal activity of nanoemulsions encapsulating oregano essential oil in more realistic environments, such as in cheese maturation chambers. The authors thank CAPES (Comissão de Formação de Pessoal de Nível Superior, Brazil) for the Master fellowship of Carolina Bedoya-Serna and Laticínio Imperial Jureia (Monte Belo, MG, Brazil) for the donation of cheese samples.